A blossom that is 4.5 inches or greater in diameter. A classification used at AHS Exhibition Shows. 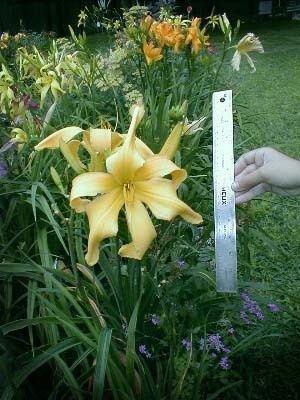 When photographing large flowered daylilies it is often useful to include a familiar object such as a ruler or coin to judge the relative size. See the image below for reference.